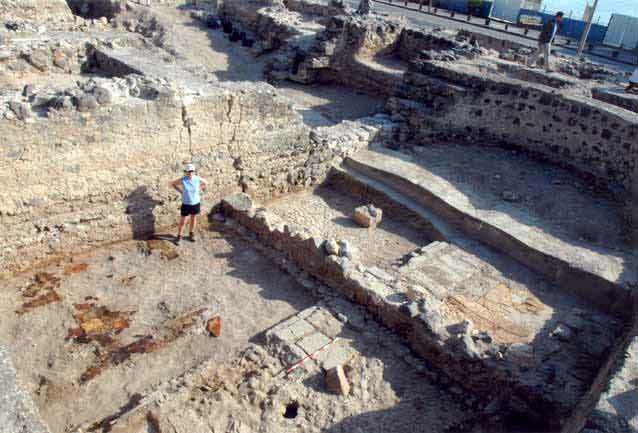 During March 2004 excavations were resumed in the urban center of Roman Tiberias (License No. G-10/2004). The excavation, on behalf of the Institute of Archaeology of the Hebrew University in Jerusalem, funded by the Avihai Foundation, with the collaboration of the Municipality of Tiberias and the approval of the Antiquities Authority, was directed by Y. Hirschfeld, with the assistance of A. de Vincens (registrar and ceramic analysis), N. Zilberstein and E. Meir (area supervision), D. Porotzki (surveying and drafting), A. Berman (numismatics) and D. Elisha (administration). The excavating volunteers were pupils of the Land of Israel studies from high schools throughout the country, headed by M. Greenzweig. During the first season, an effort was made to clean the areas that had previously been excavated, several of them many years ago. The mosaic in the bathhouse was restored by a team of experts from Italy, in cooperation with the Conservation Department of the Antiquities Authority. The work in the current season was focused in the basilica (Area F; Fig. 1). This public building was erected in the fourth century CE and used for hundreds of years. Parts of it were exposed in the 1960s and the 1990s (HA 12; ESI 16). 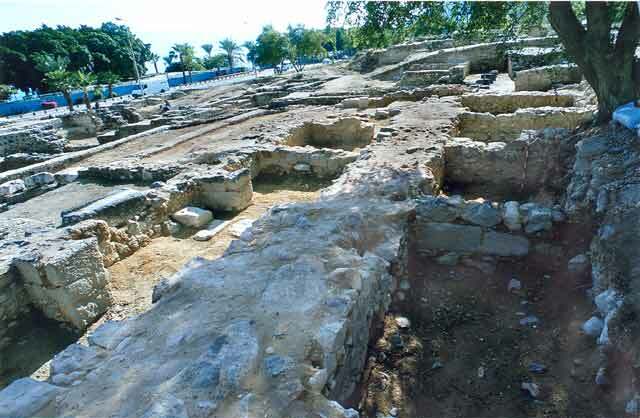 Activities that prepared the site for public visitation were undertaken during the excavation. Deep pits were filled in and walls damaged by mechanical equipment were reconstructed. The eastern part of the basilica was damaged in the 1960s when tractors dug a channel for the briny conduit. Several phases of the apse, indicating that the basilica was expanded eastward, were exposed during previous excavations. Stratum VII (first century CE). The excavation was deepened on both sides of the briny conduit, reaching the Herodian level on which the basilica was erected. Parts of a floor that consisted of divided marble slabs (opus sectile; Fig. 2) were ascribed to this period. These were exposed in the area of the apse and in several places slightly to the west. A long wall with traces of a red fresco below the basilica’s foundations (Fig. 3) was also dated to this period. It is presumed that this was the remains of Herod Antipas’ magnificent palace, which Josephus Flavius described in his writings. 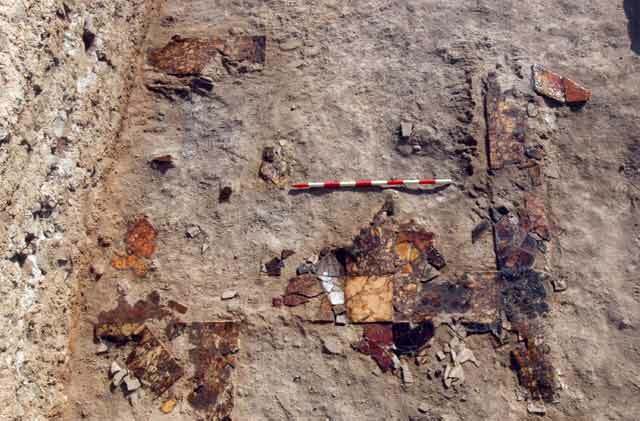 Further exposed remains of this building included pieces of frescos painted in red, ochre, as well as blue and green, which were scattered in abundance throughout the excavation area. The chronology of this stratum, which until now was only estimated, has now been determined by means of some Early Roman pottery that was found beneath the floors. Stratum VI. The remains of this level dated to the Roman period (second–third centuries CE) and were mostly uncovered in Areas A and C. Area A included the bathhouse and Area C consisted of the covered marketplace. Remains of the Hadrianeum––a temple dedicated to Hadrian whose construction was never completed––were discovered to the north of Area C. The cardo was also paved during this period. Stratum V (fourth century CE). A channel that conveyed surplus water from the water cistern below the basilica courtyard (Fig. 4) to the system of channels beneath the basilica was discovered in the northeastern corner of the water cistern. 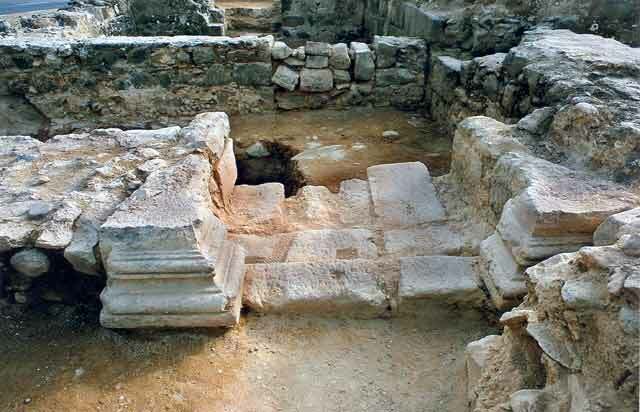 The water system below the basilica was probably incorporated within the urban water system of Roman Tiberias. The basilica compound included other rooms north and south of the nave and the courtyard. Purple glass tesserae, which were found in one of the northern rooms, may have been originally part of the glass mosaics that adorned the walls of the room. A mosaic section in an adjacent room was found inside an apsidal niche, only half of which could be seen in the area. At a later phase a wall that severed the niche into two parts was built. This wall can be attributed to Stratum IV. Stratum IV (sixth century CE). Another, eastern wing, was apparently constructed east of the apse’s outer wall during the Byzantine period. It was accessed by way of an entrance adorned with magnificent doorjambs, in situ, whose lower parts were dressed to resemble half Attic bases (Fig. 5). The eastern wing was probably destroyed in the earthquake of 749 CE. The collapse inside the rooms contained numerous roof tiles, some of them almost complete and a large quantity of plaster and fragments of a plain mosaic floor. A noteworthy find from this destruction was a large bronze goblet-like mortar and a pestle that was found nearby, in the collapse of one of the rooms (Fig. 6). In all likelihood, these were not simple kitchen utensils, although their usage is unclear. Stratum III (eighth–ninth centuries CE). 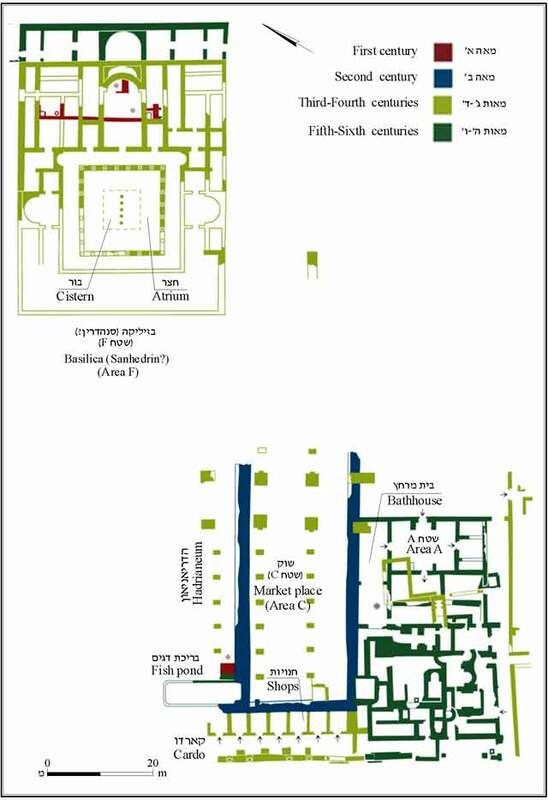 Several rooms, dating to the Abbasid period, were excavated south and north of the basilica. It is unclear whether the building continued to be used in its original plan in this stratum too. The rooms were small and almost each contained some sort of installation. Notable among them was a stone-lined pit that contained a rich assemblage of Abbasid pottery, including intact lamps and jugs (Fig. 7). Another room had a square corner installation built of dressed stones in secondary use (1 × 1 m) and a large ceramic basin (diam. 0.7 m) was embedded in the room’s floor. These two installations joined a unique basalt basin that was discovered in an adjacent room in the excavation season of 1993. The purpose of the installations has not yet been ascertained, yet it seems that the rooms served industrial purposes and were not dwellings. A complex of rooms was built on the western side of the basilica’s courtyard; only some of the rooms were exposed in their entirety . The rooms were arranged to the west of a wide wall (Fig. 8). In addition to the numerous vessels recovered from the excavated rooms, which were positioned to the west of a wide wall, the finds included a large amount of animal bones, some of them cut, probably indicating a meat industry in Tiberias. An elongated room was on the east side of the wide wall. Judging by the repairs and changes made to the room, it was apparently used over a long period of time. Its western wall was substantially thicker and pilasters were added to its eastern wall. These repairs were apparently required due to earthquakes that occasionally struck the region. This wing was also destroyed by an earthquake, evidenced by the numerous pottery vessels smashed on the floors of the rooms and the many roof-tile fragments that were recovered from the collapse. The multitude of magnificent vessels raised the possibility that in the Early Islamic period this building fulfilled a public function. More rooms were built on the southern side of the stoa that surrounded the courtyard. Delicate plaster remains were discerned on the walls of one of the rooms. A coin from the ninth century CE was found on its floor. An adjacent room was paved with a hard plaster floor that yielded a coin, indicating the room was built in the eighth century CE. In this phase the stone pavement that sealed the southern stoa was also covered with a beaten-earthen floor. The floors of the Abbasid period were characterized by a thick bedding of pebbles and small gravel that was brought from the shore of the Sea of Galilee. The floor levels attested to repairs in the rooms that were carried out during the Abbasid period; however, it was difficult to determine the chronological separation between the levels. Stratum II (tenth–eleventh centuries CE). The numismatic and ceramic finds supported the assumption that at least the basilica did not continue in use after the second half of the tenth century CE. This is in accordance with the historic evidence that mentions Tiberias as a prosperous commercial center at this period. 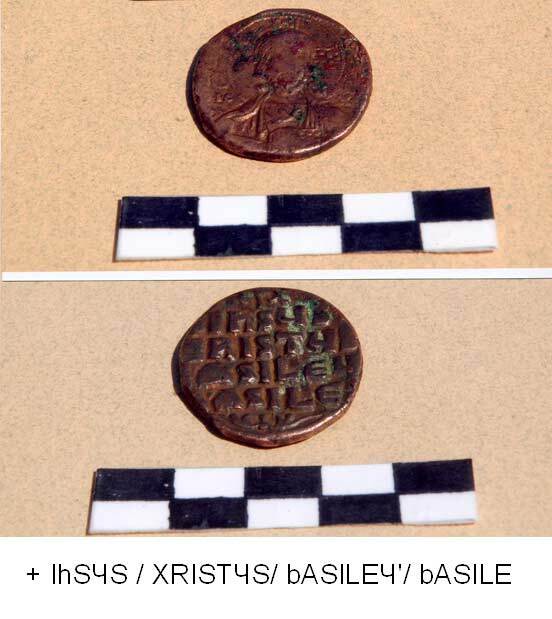 Among the recovered coins were 4–5 anonymous folles (‘Jesus coins’), dating to the middle of the eleventh century CE. The image of Jesus was depicted on one side of the coin and an inscription in Greek: “Jesus the messiah, king of the kings” was on the other side (Fig. 9). Other coins belonged to the later collapse and fills that covered this side of the city, perhaps at the time when masonry stones were removed for reuse (Stratum I). Numerous bronze vessels and objects were found in this excavation, as in previous excavations at Tiberias. 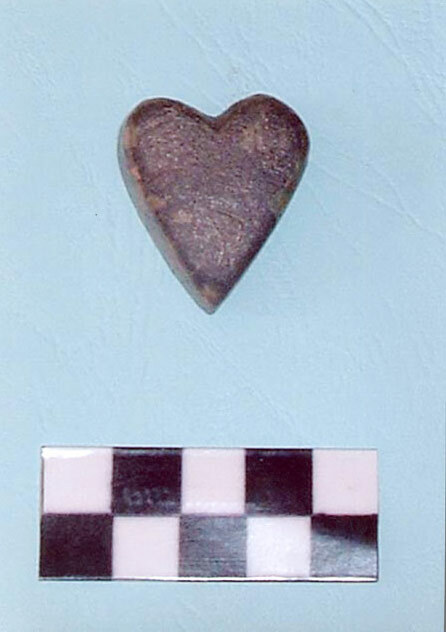 A special find was a heart-shaped weight (Fig. 10). It was suggested in the past that the basilica should be identified as a private villa. It appears more likely now to define the basilica as a public building. It was probably the seat of the Sanhedrin or the high court that was connected to the president who resided in Tiberias. Basilicas are known to have served as courthouses throughout the Roman empire. However, it should be emphasized that so far, any finds to confirm or deny that the building served the Jewish community of the city, had not been found. Stratum I. Late Fatimid, eleventh century CE; construction above the collapse caused by an earthquake (in 1033 CE?). Stratum II. Early Fatimid, ninth–tenth centuries CE; continued use of the street with shops. Stratum III. Abbasid, eighth–ninth centuries CE; a row of shops, the basilica building was renovated. Stratum IV. Byzantine–Umayyad, fifth–seventh centuries CE; the eastern wing was added to the basilica building; the paved street; destruction was caused by the earthquake in 749 CE. Stratum V. Late Roman, fourth century CE; construction of the basilica complex, as well as the city’s institutions, i. e., the bathhouse and the covered market place. Stratum VI. Roman, second–third centuries CE; establishment of the Hadrianeum in the second century CE (temple dedicated to Hadrian that was never completed) and industrial installations; the paving of the cardo and the city’s infrastructure. palace with the marble floor on the shore of the Sea of Galilee, opus sectile, fresco. Stratum VIII. Hellenistic, second–first centuries BCE; fragments of typical pottery vessels (fish plates, Megarian bowls). 1. The remains in the center of Tiberias, plan. 2. Stratum VII, Opus sectile floor. 3. The Herodian period, marble floors and wall remains, looking northeast. 4. 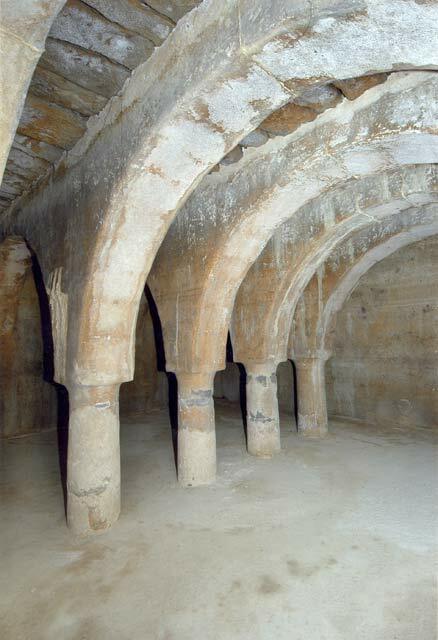 The water cistern beneath the basilica. 5. The entrance to the eastern wing of the basilica, looking south. 6. 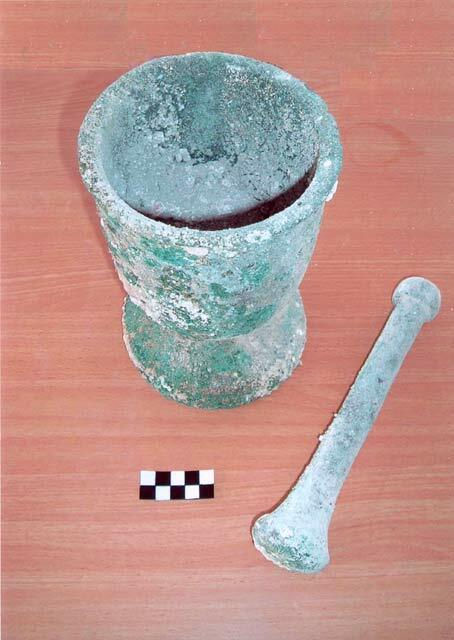 A bronze mortar and pestle. 7. 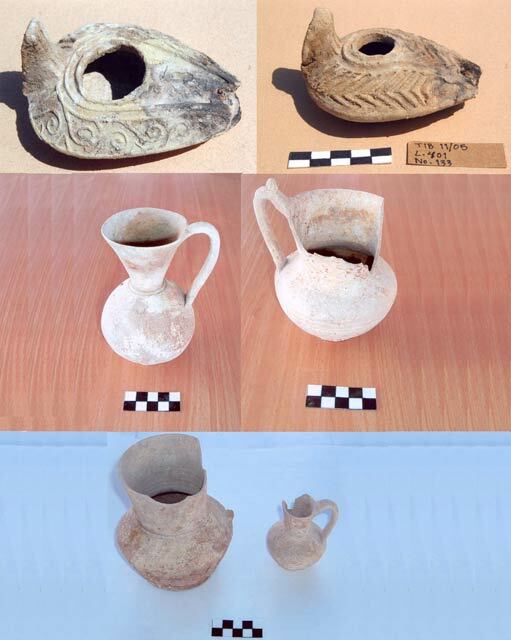 The Abbasid period, lamps and vessels. 8. The Abbasid period, a room complex, looking southeast. 9. An anonymous folles coin.